So, Olivia asked me to make a pie out of Girl Scout cookies. It’s that time of year. Girl Scout cookies are everywhere and if you have a Girl Scout in your house, you probably can’t walk more than 20 steps without running into a box of cookies. I had originally agreed to do a pie with peanut butter sandwiches but couldn’t find the recipe when I looked for it. So, I went with a recipe I found on The Girl Scouts of Kentuckiana’s web site. They have quite an impressive list of what you can do with them, from Cheese Cake, to Tarts, to Brownies, to Chocolate Sauce. The site’s a diet buster of major proportions. The recipe list is here. Coarsely chop one full package and six additional Samoas. Melt the half stick of butter. Mix and press into a standard 9″ pie plate. Bake at 350 degrees F for 5 minutes and refrigerate until firm. Pre-heat oven to 425 degrees F. Combine 1/2 cup of sugar, cornstarch and salt in a medium saucepan. Add the milk and cook over medium heat, stirring constantly until mixture thickens slightly. Remove from heat and set aside. Beat egg yolks with an electric mixer at high-speed until thick and lemon colored. Stir about 1/4 of the custard into the yolks and blend well. Stir the blended mixture back into the remaining custard and cook over medium heat for 2-3 minutes, stirring constantly. When mixture thickens to custard-level consistency remove from heat. Stir in butter, 3/4 cup coconut flakes and 1 teaspoon vanilla extract until butter has melted. Pour mixture into your baked pie shell. Beat the egg whites at high-speed with an electric mixer until just foamy. Add the cream-of-tartar (blech) and vanilla, and gradually add the remaining 3/4 cups of sugar. Continue beating until stiff peaks form and the sugar has dissolved, about 2 minutes or until you can turn the bowl upside down and the meringue stays in place. I learned that one watching Top Chef. Spread the meringue over the pie filling, covering to edge of pie dish. Sprinkle with remaining 1/4 cup of coconut. Bake at 425 degrees F for 5 minutes or until meringue is lightly browned. It’s very chocolatey, custardy, sugary deliciousness. It’s a candy store in your mouth. I thank you John. 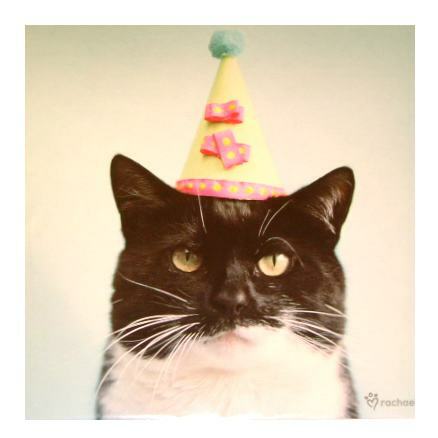 And because I’ve already shown you a meringue pie, this week I give to you cat-in-a-party-hat.